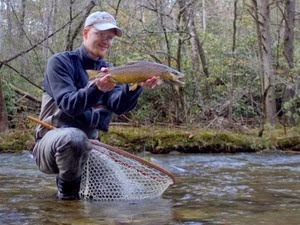 On Friday I decided to take advantage of a rise in water levels in the Smokies to throw a few streamers. 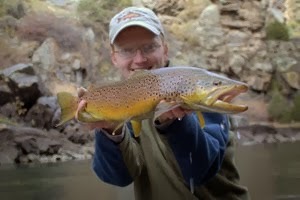 This is a type of fishing that I haven't done enough of, especially on mountain streams. While up there, I stopped by Little River Outfitters to pick up my 2009 fishing license and a new net that Daniel had ordered for me. I'm excited about the new net. Last year I was fortunate to catch some very nice fish which were a bit large for the nets I already had. 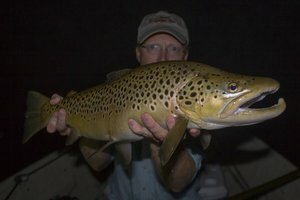 Trying to corral a big brown in a net meant for average fish is difficult to say the least. 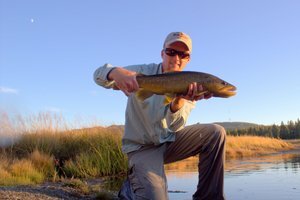 My trips out west to such destinations as the South Platte, Frying Pan, Taylor and Gunnison rivers in Colorado among other places has always resulted in nice fish. This year I wanted a net that would help get the fish back in the water quickly with minimal handling and stress. The perfect solution was the Coho Ghost Net from Brodin Landing Nets. This net is very large and will work well for anything from trout to steelhead and salmon so I should be set for awhile when it comes to nets. 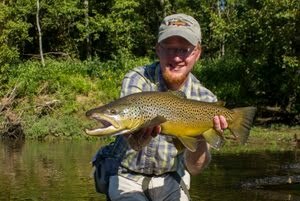 I rarely use nets except on larger fish so I only need to carry it when large fish are a definite possibility. The net is quite lightweight for its size making it reasonable even if I need to walk some to my fishing spot. So far I'm really happy with the net. Once I have a bit more experience using it I'll provide an update and short review. "I rarely use nets except on larger fish so I only need to carry it when large fish are a definite possibility." Irony Alert! Everyone knows your need for a net is based entirely on whether you brought it or not. Bringing the net because you hope to catch big fish is a one-way ticket to dinkland. Leaving the net in the car because it's "all small fish" where you're headed means you'll soon have a 19" trout thrashing around at your feet. I want to catch the fish, that eats the fish that eats that bug!